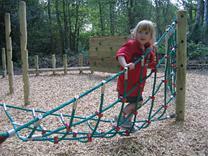 There are 3 designated play areas at different locations around Highwoods Country Park. 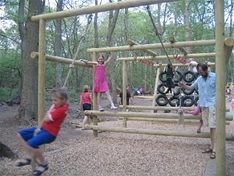 They all make use of natural elements like wood, rocks and trees to create the traditional play equipment. All are set in the wonderful woodland making for very idyllic settings. 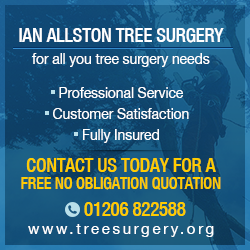 This is great for mum’s, dad’s and grand parents as they can sit and enjoy the surroundings as the children play. What makes the play equipment special is that they have been designed with the help of local schools. The equipment has been designed so that there is something for all children of all abilities from toddlers through to young teenagers. It is designed so as to challenge all children to allow them to test and stretch them. For your safety please do not bring dogs, glass or alcohol into the area. The 2 main play areas are enclosed with a fence that helps stop inquisitive dogs enjoying a walk off the lead from coming into the play area as the children play. This is a no smoking and no litter area – please use the bins around the car park or take your litter home to keep the woodland neat and tidy.